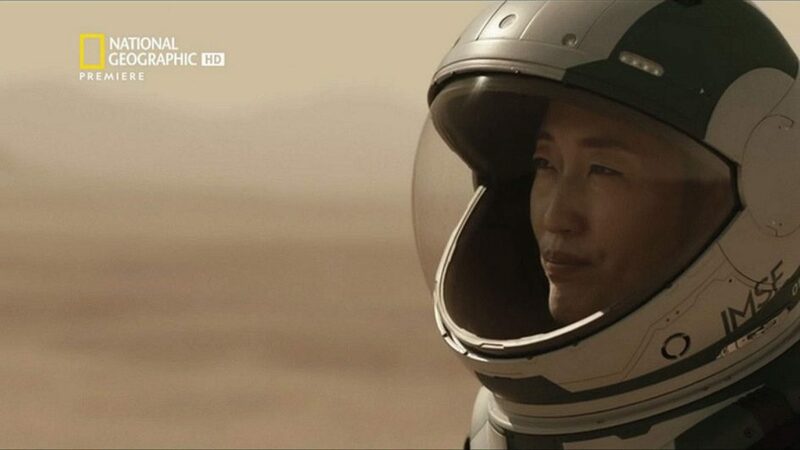 Season 2 of National Geographic's Mars looks toward the future of colonizing the Red Planet. Photo Courtesy: Nat Geo Channel. Exploring the Red Planet absolutely fascinates me. There’s quite a few stories that I absolutely adore that focus on Mars, the planet, including National Geographic Channel’s global event series, Mars. I really didn’t know what to expect from Season 1 of this show, which progressively improved with each episode. It was decent. So, when I saw that the series had returned, I was excited, to say the least. Two years in the making, Season 2 starts five years after the first season ended, beginning in April of 2042 with the International Mars Science Foundation (IMSF) still conducting scientific experiments and slowly terraforming the planet, trying to get it ready for human colonization. New this season is the never-ending conflict of also having a private business (Lukrum Corporation) arriving, working alongside (but usually against) the international group of governmental agencies already there laying the groundwork for a future inhabited home. With these newly introduced characters, we have miners with very little communication skills and a very loose interpretation of international laws demanding the very-scarce resources of IMSF. There’s politics at foot, science and even some romance intertwined within the storyline. This slow-burn style tests the limits of the audience to stay attentive. That may prove difficult, as this season only includes six episodes, just like the previous one. Homesickness, depression and anxiety are all real-life issues that are hard to display easily on the screen in the season premiere, “We Are Not Alone,” but these are important issues, along with shoddy safety protocols that are explored in this otherworldly tale. Presented as a part of Starstruck, a yearlong celebration exploring the past, present and future of space exploration, there’s a focus on building a future in this series, which is its strong point. Much like Season 1, there’s authors, astrobiologists, journalists and oil drillers, as well as scientists who propose ideas about possibly living on the Red Planet, creating a documentary-like feel, which is the polar opposite to the narrative that’s being told. Much like what was proposed in Andy Weir’s (who makes an appearance here) The Martian, patience is necessary when dealing with life on Mars, as it’s a hostile, expensive, remote and most of all, dangerous environment for attempting to live in, but it is interesting to imagine what it would be as the first group of people trying to terraform the Red Planet and all the obstacles they’d have to maneuver around. I’m always up for watching a GOOD science-fiction program, especially one that really focuses on the science FACT realm. Notable real-life talking heads make it seem that at some point, humanity can and will eventually have outposts there. But since Amazon doesn’t deliver supplies to the Red Planet, it will be difficult setting up an overall infrastructure. With different countries helping out (what about a Chinese Space Station orbiting nearby? ), space drones controlling most of the hard work in outer space and plenty of 3-D printers, which are essential in basically building everyday items, it does seem like it’s a doable situation. Here’s to being thankful for a little bit of positivity for our species’ future. May our co-existence with other countries, while fighting the hostile environmental conditions, as well as private companies seeking profits, be a peaceful one.